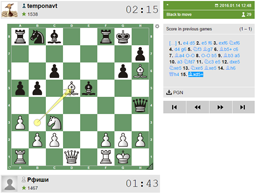 For everyone interested in chess, we provide a free online chess gaming server. Play chess, participate in tournaments, take or give lessons, follow and discuss broadcast games and tournaments, join and organize teams. More than 75,000 games are played daily, with average online of over 1500 players. Play with customizable time controls, including freestyle. Play in daily prize tournaments for free – individual, team and mixed (individual and team) tournaments are held regularly. Create or join a team and fight your way into the League Tournaments. Buy a one-year Membership at ChessOK Playing Zone (log in using your Playing Zone username), and gain full membership rights for only $18 / €14! New! Use our new apps for iPhone/iPad and Android OS to play wherever you want! › We provide online technical support and refereeing, including our unique Anti-Computer Control system. › On Wednesdays and Saturdays, unlimited free access to tournaments is open to all players. On other days, tournaments are only available to paid members. Chess is a great strategic and competitive game. 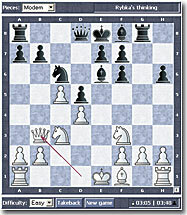 You can compare online chess to a game such as online poker, see www.onlinepoker.co.nz. A game which has elements of skill and enjoyment from its huge fan base. Many different poker sites offer games for New Zealand players and around the world. To start playing, download the client, install it on your computer and register a new account. If you have never used our client before, consider watching the video introduction. or read the manual. Membership at ChessOK Playing Zone providing you with full membership rights is available here. Play right in your browser! You are no longer limited by your computer platform! The web version supports extra features, such as online teaching courses, playing against computer, forums and online head-to-head tournaments! With this app you can play in the ChessOK Playing Zone on your iPhone or iPad. Install this app to play in the ChessOK Playing Zone on your Android-based device. Requirements: The application can be installed on Android 2.2 devices and newer, supports English and Russian. Test you chess skills and challenge one of the strongest chess playing programs in the world! You have three levels of difficulty to select from and it’s possible to change the appearance of your chess pieces. Click New Game to choose the colour of your pieces – White or Black. To enter a move you should click on a piece and drag it to the desired square. Do you enjoy solving chess puzzles? We invite you to test your chess skill for free on our online chess puzzles! 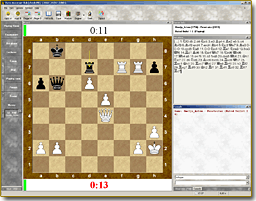 There are 1200 chess puzzles for different levels, from beginners to intermediate players. 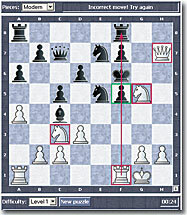 The Opening Tree mode from our chess bestseller – Chess assistant – is now available online! You can now receive detailed statistics on all opening moves carefully classified and stored in our opening database. 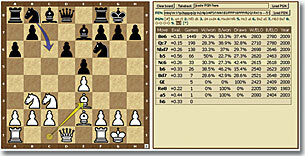 ChessOK provides weekly chess databases containing 2000-3000 new games in CA and PGN format. Save file on your computer, unpack, and then open and analyze it in your favorite chess program (we recommend our Houdini 4 Aquarium and Chess Assistant 14). Latest Game Service available here. For chess players, playing casino games might seem an unusual move. However, they’ll be surprised to discover that many online casino games require a good understanding of strategy to become a confident player (find the games discussed here, and others, at online-casinos-canada.ca). Blackjack is the best example of a game where understanding strategy is imperative – it doesn’t help you to predict what card is coming next, but you better understand the chances of winning a hand in any given situation. If you’d like to put chess and strategy aside and give pure luck a chance, try your luck on an online slot machine. It has a random number generator which makes each spin completely random. However, make sure to choose a trusted, generous and secure online casino to increase your chances. Visit Dreamz and brace yourself for a casino adventure of your dreams. If you are looking for games with a gameplay a bit closer to chess, where strategy is everything – hit the table game, Blackjack, Baccarat or Poker. Where you don’t play against a computer.